Remember when we first blogged about the pop-up retail spaces up for grabs from Rize? 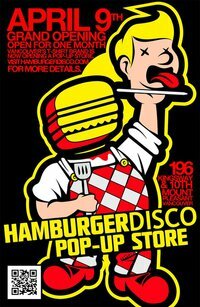 Well, Hamburger Disco has been chosen as one of the first businesses in the new pop-up retail space and their grand opening is taking place this Saturday! As one of the first companies to set up shop, they are working really hard to build their store of their dreams including a slew of new items such as new designs, sweaters, v-necks, kid shirts, shorts and accessories. As part of Hamburger Disco's Vancouver Artist Series, they have handpicked nine of Vancouver's best artists to collaborate with on some amazing new designs. You can check out the full details and list of participating artists here. Oh, and make sure to go early. The first 25 customers will receive a FREE Hamburger Disco tee. Woo!